I don’t know what it is about Saige, her curly auburn hair, her adorable freckles, or the fact that she feels just like me when it comes to crowds. For whatever reason it is, she is definitely one of my favorite American Girls. Last spring I had given myself the mission to find Saige. I had searched and searched, but some of the prices she was going for I could not justify. Then I had the idea, that since I couldn’t afford an 18 inch Saige doll, I would opt for a mini Saige instead. After a short search I came to learn that she was even harder to find, and once again out of my price range. Dee-dee and I let out simultaneous gasp when found this awful rip in her body! It looked like Saige tried the side spilts and didn’t recover, poor beautiful Saige! We got straight to work restoring her to former glory; while I grabbed my sewing kit, Dee-dee washed Saige’s skin and brushed her hair. So how did we fix that rip? First we removed her head, (Dee-dee got a bit squeamish at this point, so I had to take over). Once her head was off, I removed her stuffing so I could get to that rip. Make sure you keep the stuffing all together in a safe place, you don’t want to lose any! Since I needed to turn her body inside out in order to repair the rip, I had to remove her limbs. You can do this one of two ways, since this doll’s limbs were quite loose, and the elastics needed to be replaced, I chose to cut through the strings. 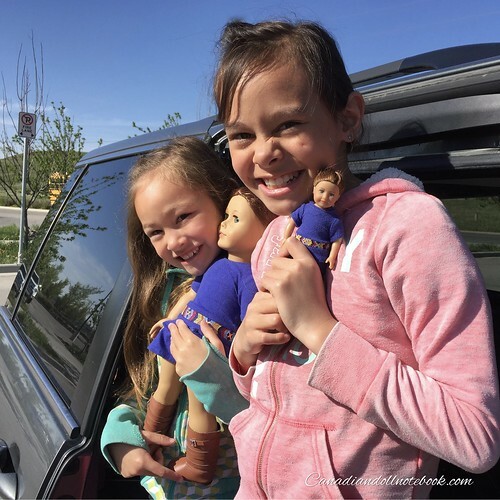 If you are working on a newer American Girl doll and her elastics are nice and tight you can simply untie the knots from the inside and reuse the strings. Here is body turned inside out, now to get stitching! I choose a colour of thread that was close to the same colour as Saige’s body. Since her body had a true rip and not just a split seam, I opted to use a whipstitch. If your doll only has a split seam I would recommend using a ladder stitch. 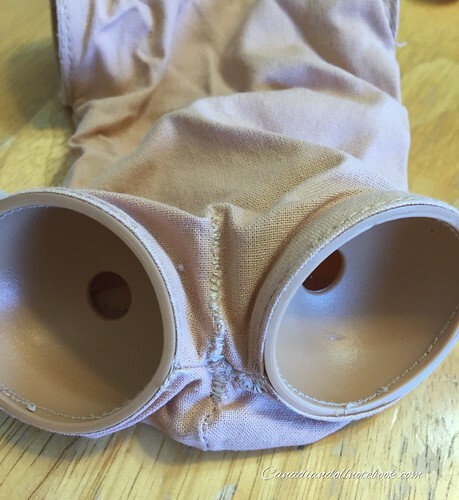 Since the American Girls are stuffed fairly tight ensure that your stitches are close together, and either double up on your thread or go over the rip twice as you don’t want your new seam to bust when you go to re-stuff the doll later. Here is her body all stitched up and ready to go! 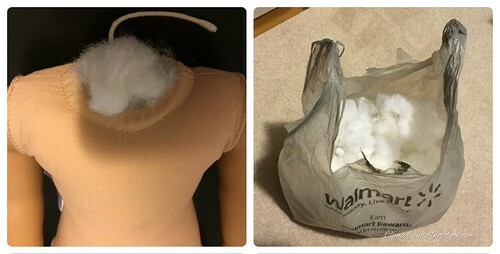 Next step is to reattach the limbs and add the stuffing. Reattaching the limbs is quite a process so I am going to write about that in my next week, stay tuned! When re-stuffing your doll ensure you start at the bottom, and stuff in as much stuffing as you can down there, and get it in around her leg joints before you start moving up. 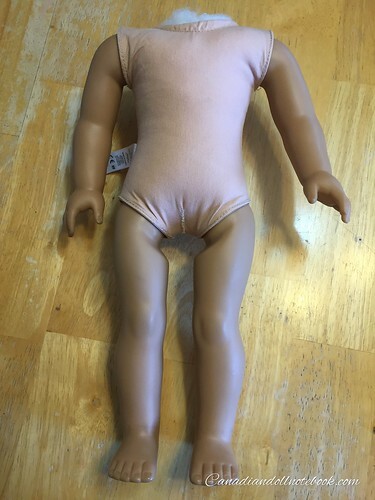 Stuff her tight, it’s incredible how much stuffing goes into these dolls! Here is the beautiful cheerleader all ready to go home, no more side splits for you Saige, front splits only! 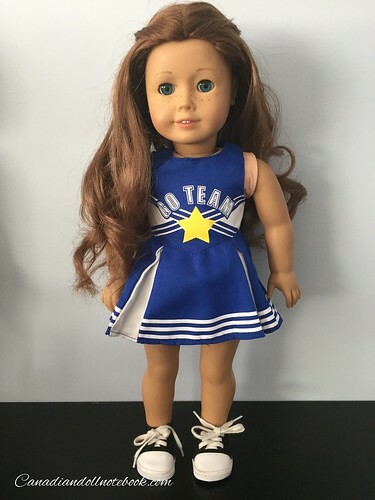 After we sent Saige home, I continued my search for our own Saige doll… to my delight I found an 18 inch Saige listed on Kijiji! So I packed up my girls, and we made the trip into the city to pick up this doll we adore. When I arrived the seller had a surprise for me, not only did she have the 18 inch Saige for sale, but a mini Saige too!!! My girls and I were over the moon, finally we had our Saige and a mini Saige too! Wow! I had to fix a poor little Journey Girl who had been ripped like that by ‘bad boys’. 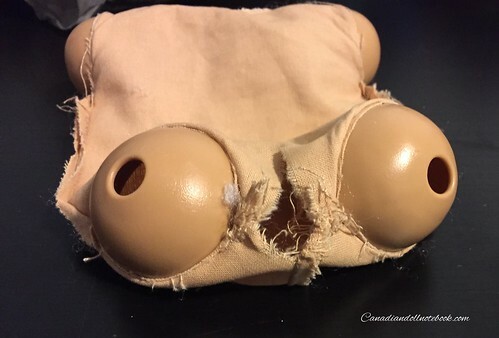 But her damage was so bad, I opted to replace her cloth body….tricky but I did it. She didn’t have any strings or elastics to deal with, so I can’t wait to see how that’s done. Well done, Megan! I am so impressed Sandra! I would like to give that a try one these days. 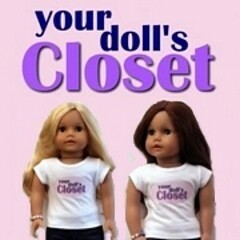 I have heard that there are patterns available online for AG doll bodies, now I want to look into it! Okay, I have to admit, i get a bit squeamish when it comes to these types of procedures too. The first time I watched a tutorial on tightening I almost fell off my chair. However, I made it through your post. Congratulations on fixing and finding Saige(s)! Wonderful additions to your collection! Clearly I am the opposite, I love to take apart dolls… it’s so much fun! We love our Saige dolls and I am so happy that they could join our family!